From the Ponder Couch: 5 Things That Scared Me as a Child! 5 Things That Scared Me as a Child! If memory serves, I was scared most of the time as a child. I was scared of many of the normal type stuff; the dark, ghosts, etc. But I was also scared of a lot of things that did not seem to scare anybody else. Halloween is coming! So I thought it would be appropriate to make a list of scary things! Here are 5 things I was scared of as a child that now I find... charming? I loved this PSA, but it also scared the crap out of me. The things that I was scared by were often the things that also fascinated me and made me obsessed. He reminds me of Mr. Butts from the Doonesbury comic. This cartoon PSA animated by Everett Peck (creator of Duckman!) was a lot of fun. I remember my cousin and I were pretending to be Nic and the other characters during an afternoon of play. The thing that scared me was the voice who said, "STRIKE ONE". But it wasn't STRIKE ONE, or TWO, or THREE that scared me. It was how he said, "YOU'RE OUT!" and the strike of the curtain falling. It just seemed so loud and final. Now I think it's great! When I was in early elementary school I lived in Turtle Lake, North Dakota. One of the things that scared me was this water tower. It wasn't the water tower itself that scared me, but the idea that if someone opened that door in the tiny teal building at the base of the tower it would flood the whole town. I don't remember what put this idea in my head, whether it was something that an older kid told me could happen or if I just used child logic and figured out that that could happen, I don't remember. But it scared me nonetheless. Now that I'm an "adult" I know that it doesn't work like that. But what the heck is that building for? I was home alone one day when I turned the channel to PBS (this was also in Turtle Lake). Then all of a sudden this Monty Python sketch was on the screen. It scared me so much that after watching the whole sketch I turned the TV off and ran over to the church basement (next door) where my parents were to tell them about it. They said something like "if it scared you, then why did you keep watching it?" It was 8-10 years later that I found out how amazing everything Python did/does is and fell in love with the show, including this sketch. But seriously, PBS, put a warning on before this episode. 4. The Clown Doctor Scene from "Pee-Wee's Big Adventure"
I had "Pee-Wee's Big Adventure" taped off of TV and watched it over and over again. I loved clowns, but this scene was enough to give me Coulrophobia! I'm not sure if I'd seen this movie before and was scared of this scene or if my parents knew me well enough to know this scene would be too much, but my taped-off-of-TV version was missing this scene. I think I remember my dad edited it somehow. I watched this scene again and it's still creepy as all get-out! 5. Showbiz Pizza Animatronics and Walk-around Characters! I love ShowBiz Pizza! If it was still around I would find excuses to go there. But, alas, it is no longer around. 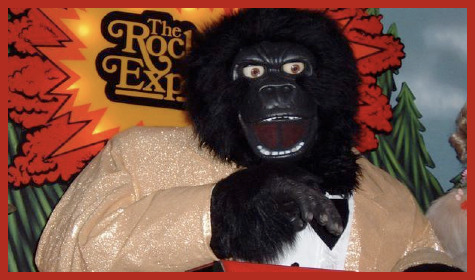 I remember wanting to build my own Rockafire Explosion-style band. I even made some cardboard characters and set them up on the coffee table in our basement (I wish I had pictures of it). But MAN did those characters scare me. I'm still scared of animatronics, but what really did me in was the walk-around characters! If the characters stayed on stage, I felt safe. I was still scared, but in a watching-fireworks-on-the-fourth-of-july-from-the-backseat-of-your-car scared. But when a song ends and Fats was standing right behind me? Stay on the stage, behind your keyboard, Fatz! That's all 5 of the things! There were plenty more, but that's enough for this list. Maybe I'll do another 5 before Halloween has come and gone. Billy-Bob was almost as bad. Seriously, stay on the stage. Candy Corn and all the summer Bumpers! How to: Shave like a Real Man! A Big Mouth full of Ecto Cooler! 3 More Bumpers and a couple of Guitprov Songs! 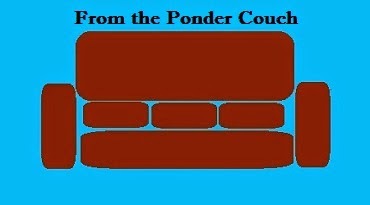 Ponder Couch Bumper - Bite! Good Eats! and Burrito Baits! New P 'n E Drawing and other Drawings!! !